For those of you who didn’t pay a great amount of attention during High School History class, Amelia Earhart is one of the of the most important figures in Aviation and even female rights history. She was the first woman to cross the Atlantic, held and broke a dozen aviation records, wrote and lectured her story before becoming a editor at Cosmopolitan Magazine, bucked the trend by marrying her husband and keeping her own last name, and even found time to form the female aviators club. With a life filled with those sorts of events, you would think it would be very simply to fill out a few hours of entertainment, turns out it’s not. As previously explained, Amelia Earhart (Hilary Swank) was a pioneer in female flight, and the features picks up at her greatest moment in 1928 when she becomes the first woman to cross the Atlantic in a plane. 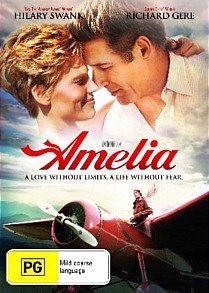 After that though its simply a staggering of events of records and her relationship with promoter George Putnam (Richard Gere) as well as her glancing affair with Aviation Executive Gene Vidal (Ewan McGregor), finally culminating in her death whilst trying to fly around the world in 1937. Unfortunately the key to this film is the connection and chemistry of the characters, and it simply isn’t there. Swank and Gere both have a similar acting style of remaining stone faced while trying to pull at the audiences heart strings, but with both of them sharing the screen, you never get a opportunity to connect with the characters, leaving you waiting out many dialogue scenes and hoping for a brighter corner to come. Swank should be a obvious choice for this role, with an Oscar history and a physical similarity to Earhart, she fails dismally at this role, making Amelia appear as a one dimensional, uninspiring, and frankly boring character. You can discover some engagement by Earhart’s flight around the world, with moments of tension and some amazing shots, it is the peak of the film, and unfortunately it’s also moment before her death and the end of the film. The film was set against a few disadvantages, it has a big history to live up too, it was obviously aimed at Oscar nods, and it will always be compared with other recent bio pics such as ‘Walk The Line’ and ‘Ray’, with all these weighing it down, it never even leaves the air strip.